To be specific, these cars were manufactured at the Osgood Bradley plant of the Pullman Standard Car Manufacturing Company. Osgood Bradley was a long-time car builder providing head-end and passenger cars to the New Haven for use in both electrified and non-electrified regions of the railroad. The prototype lightweight cars have several names including Pullman-Bradley in recognition of the company and plant location. This name is more correct than Osgood Bradley since by the time these cars were delivered to the New Haven, Pullman Standard was the owner of Osgood Bradley. Another name established by railfans is the “American Flyer” car. Shortly after the New Haven received these lightweight cars, the Gilbert Company (based in New Haven, CT), which sold American Flyer brand trains produced models of these unique cars in several scales. HO scale versions of these coaches (and a baggage/RPO) were cataloged under the American Flyer banner as early as 1939. When the coachers were painted in the McGinnis New Image scheme they gained another nickname; “Black Knights”. As delivered there were three basic configurations of the prototype for a total of 205 cars on the New Haven; 10-window, 84 seat Deluxe coaches; 11-window, 92-seat Deluxe Coaches and 53-seat grill cars (5 cars) that were later rebuilt to 92-seat, 11-window coaches. Beginning in 1940 and continuing through 1949, one group of 10-window coaches was converted to 64-seat coach, 16 seat smoker section cars. All cars were delivered with side skirts that concealed all underbody equipment and most of the trucks. The skirts were part of the lightweight, aerodynamic styling of the cars. Between about October 1947 to February 1952, the skirt sections covering the trucks and sideframes were removed. By 1957 sections of the skirts between the trucks were being removed for the practical reason of facilitating maintenance, and by 1960, photographic evidence suggests that all skirting except for a small section immediately adjacent to the vestibule steps was removed. From the time the first group of cars was delivered in 1935, these cars served the New Haven well with many still in service until the end of the New Haven in 1968. The cars were transferred to new owners Penn Central in 1969 but revenue service was limited and scrapping began. None of the coaches was used in Amtrak service when they took over Northeast passenger rail service from Penn Central. As mentioned above American Flyer made a “shorty” version before 1940. At the time, many passenger cars were shortened from prototype length to accommodate small-radius model railroad curves commonly used on layouts. For more than 30 years that was the only choice for a “ready-to-run” model or for attempting to kit-bash a prototype length coach. Bennington Scale Models released a multi-media kit (photo-etched brass sides and vestibule steps, wood roof, die-cast details) of the 10-window coach in the early ‘70’s (my kit instructions were drawn in 1966 and revised in 1972) that, until 2010 was the most accurately detailed model one could hope to build. In 1977 New Jersey Custom Brass (NJCB, Custom Brass) imported brass models made by Lhee Do. Custom Brass imported 10- and 11-window coaches as well as grille cars. The cars were unpainted with no interiors, but were reasonably accurate. In the early 1980’s, E&B Valley & Company produced an all-plastic kit of the 10-window coach that was picked up by Eastern Car Works when E&B Valley closed their doors. This kit is reasonably accurate but without the fine detail of the Bennington kits. For it’s time, this was considered a very good product, but heavy rivet and window frame detail are considerable detractors for some modelers. The truck side frames and bolsters are all-plastic construction that require assembly and some modelers find the assembly troublesome and performance problematic. The kit was designed so the side skirts could be customized by the modeler to represent every period from delivery (full side skirts) to the end of the New Haven (skirts completely removed except a small section by the vestibule steps). Announced in 2009, delivered in 2010, Rapido Trains, Inc. has produced the ultimate, state of the art 10-window coach. Not only is the coach very well done, it has been offered with full and partial skirts in almost too many paint and lettering schemes to count. The cars are equipped with full interior detailing and battery-powered lighting. 8200-8269 series 10 Window, 84-seat Coaches were delivered to the New Haven between December 1934 and October 1936. Pullman Standard built cars 8200-8249 as Lot W125000 from December 1934 to February 1935. Cars 8250-8269 were built as Lot W6495 in October 1936. From this second group, Car 8251 was converted to Car 5107, Southport Club, in 1952. Car 8208 is one of two of the fantastic Rapido cars I purchased. This is a model of the car in the 401 Green scheme. My second car is in the Pullman Green scheme. My other green 10-window cars are #212 Hunter Green as will be seen in the 8500-series section, so you can see how I have cleverly avoided “conflicting” greens on my layout! Coach 8209 was modeled from a 1957 photo showing the skirting in the area of the battery box removed. I think this adds just a small bit of variety to the roster, and besides; I don’t have a 1959 photo of this same car to prove the rest of the skirts were removed by then! Most of my 10-window coaches are built without skirts, but I couldn’t resist modeling this one. Coach 8224 represents the more typical appearance of these cars in 1959 with all skirting removed and painted in the “Black Knight” McGinnis New Image scheme. 8270-8299 series 11-window, 92-seat coaches were built as lot W6496 by Pullman Standard at the former Osgood Bradley plant in Worcester, MA and delivered to the New Haven in April 1937. 8300-8349 series 11-window, 92-seat coaches were built by Pullman Standard at the former Osgood Bradley plant in Worcester, MA and delivered to the New Haven in October 1937. The first lot, W6518 consisted of car numbers 8300-8349. Coach 8306 - This is an 11-window Osgood Bradley coach, commonly known as the "American Flyer" type and represents a car from the first production lot. This particular model is a brass car produced by New Jersey Custom Brass, manufactured by Lhee Do and is from the collection of noted New Haven modeler Bob Vancour. 8350-8369 series 11-window, 92 seat coaches were built by Pullman Standard at the former Osgood Bradley plant in Worcester, MA and delivered to the New Haven in October 1938. This lot, W6558, consisted of car numbers 8350-8369. Later on in 1952, the New Haven's Readville Shops converted lightweight Grill Cars 5200-5204 to 92-seat, 11-window coaches which were renumbered into this series as 8370-8374. 8370-8374 series 11-window, 84-seat coaches were originally built as Lot W6519 by Pullman Standard at the former Osgood Bradley plant in Worcester, MA and delivered to the New Haven in August 1937 as 53 Seat Grill Cars. In 1952 the Grill Cars were converted to coaches and renumbered as 8370-8374, above the last series of cars built by Pullman-Standard as 92-seat coaches. Windows were added to the former kitchen area side of the car and exhaust vents were removed so that externally they appeared the same as the 8270-8299 series. 8500-8529 series 10-window, 84-seat coaches converted to smokers - Thirty coaches were built in September 1938 as Deluxe coaches in Lot W6557 and delivered to the New Haven. However, beginning in 1940, and in 1947-1949, Readville Shops converted these cars to 64-seat coach, 16-seat smoking section cars. It’s interesting that these cars were still being converted to smokers when the newer 8600-series coaches that were all built with 14-seat smoking sections were being delivered in 1947-48. Upon conversion to smokers, these cars were repainted into a scheme with black roof, #212 Hunter Green sides, aluminum window frames, sans serif NEW HAVEN on the letter board and script heralds centered over the truck sideframes. It’s reasonably certain the lettering was originally silver-gray, but color photos tend to show the lettering as white and it has been reported that the paint whitened with weathering in any case. It has come to light this scheme was not unique to the 8500-series smokers as at least one confirmed photo of an 11-window coach in this scheme has surfaced. The 8500-series cars were also repainted into the McGinnis New Image scheme, becoming among those cars identified as “Black Knights”. Two spotting features to identify the 8500-series 10 window coaches from other 84-seat coaches are; the rectangular roof-mounted hatch for the air conditioner unit located at the “A” end of the car, and the one motor driven exhaust fan located on the roof at the “B” end of the car (on the same side of the car as the mens’ saloon – but opposite end). This fan had a visibly larger housing that the other three exhaust ventilators, and was only present on the 8500-8529 series smokers. Car 8505 represents a Portman Hobby Distributors custom run of E&B Valley kits decorated in the smoker scheme produced quite a long time ago, . The vent on the left side of the roof has been modified to be larger than the other roof vents per the prototype. Car 8525 represents a smoker repainted in the McGinnis New Image scheme. In December 1945, to modernize its passenger car fleet with new lightweight passenger equipment, the New Haven placed a 180-car order with Pullman-Standard for a variety of car styles. This included 103 coaches, 25 parlor cars, 5 parlor-lounge, 20 combination-baggage buffet-lounge, 10 diners, 15 grill diners, and two tavern lounge observation cars. All, except the tavern-lounge-observations, were produced in the old Osgood Bradley factory in Worcester, MA. Many of these cars debuted upon arrival in Merchants Limited and Yankee Clipper service retiring most heavyweight equipment. While the Budd Company in Philadelphia, using the patented shot-weld process, had the capacity to build their cars entirely from stainless steel, the New Haven's cars were constructed by Pullman-Standard from Cor-Ten steel and sheathed with stainless steel fluting panels. One of the properties of Cor-Ten steel is that over time it forms a corrosion-resistant layer on the surface, However, over the service life of New Haven cars the Cor-Ten steel beneath the stainless steel sheathing eventually did corrode, weakening the structure of New Haven cars by the time Amtrak arrived on the scene, resulting in many cars being scrapped. From 1948 to about 1955 these cars were adorned with Hunter Green window panels and script heralds etched on stainless steel plaques. 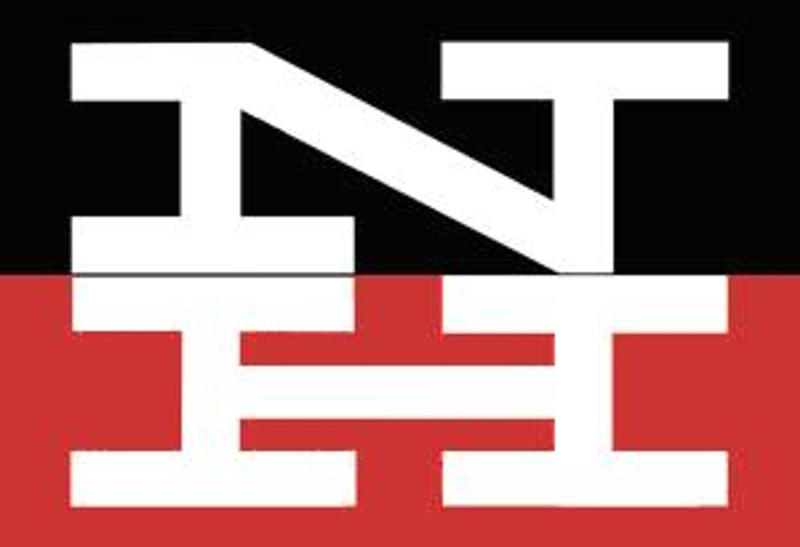 Beginning about 1955 to 1968 the decorating scheme consisted of Red-Orange window panels and block NH heralds which were painted on the reverse side of the original script herald plaques. In the late 1950s or early 1960s a company named Kwik-Bilt offered a wooden kit to assemble an 8600-series New Haven coach. Up until about 1978 the easiest way to attempt modeling New Haven Pullman-Standard Stainless Steel Passenger Cars in HO scale was to replace the roof on Athearn New Haven passenger cars with a carved, sanded and sealed balsa roof, carefully shaping the ends into the “turtle-roof’ profile. Modifying Athearn car sides was also required if close to correct window size and spacing was desired. Some skilled modelers created cardstock window panels to replace the existing car side panel. About 1978 S Soho & Company released a series of nickel-plated brass models built by Kumata in New Haven car variations including coach, baggage combine, parlor, diner and observation models. 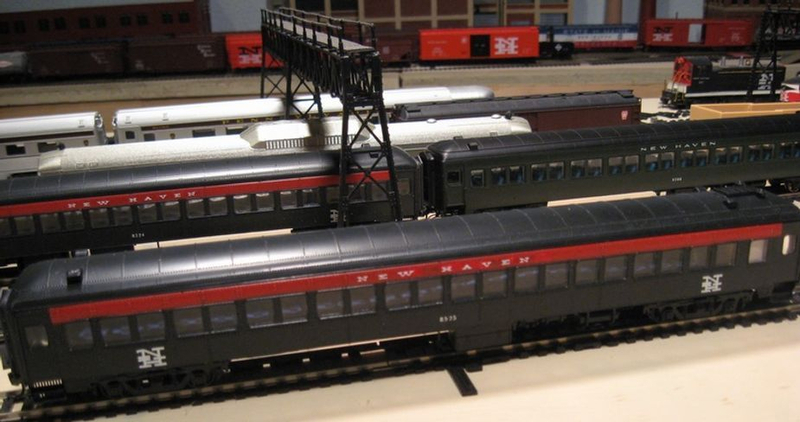 About 1982 E&B Valley produced the first plastic kits designed to produce accurate models of New Haven passenger cars. In addition to Osgood Bradley 10-window lightweight coaches, 8600-series coaches and 200-series baggage-buffet-parlor/lounge kits were also offered. The 8600-series coach was released with Hunter Green and Red-orange window bands as well as undecorated. The provided roof was the same from the Osgood-Bradley coach which included heavy rivet detail that was not correct for the 8600s. Other than the roof, the second main detracting feature was the overly-thick sheet plastic used for the letter boards, number boards and herald plaques, which is easily replaced with thinner 0.005” sheet styrene. Also similar to the Osgood-Bradley kits, some modelers were not pleased with the truck sideframe assembly. Eastern Car Works (ECW) continued to offer the Osgood-Bradley and 8600 coaches and in addition produced 41-BNO and 61-BNO plastic truck kits. By the mid-1980’s, Concord Junction introduced nickel-plated photo-etched brass car sides for New Haven parlors, sleepers, diners, grills and observation cars. Eastern Car Works produced the correct Pullman-Standard sleeper bodies to mate with the sleeper sides, and ECW kits could be used for the parlor, diner and grill sides. ECW also produced a limited run Observation core kit which consisted of half-ellipse pieces to modify one end of a standard ECW New Haven kit roof and floor pieces. In the early 2000’s plain brass Concord Junction photo-etched car sides could still be found – some for sale through NHRTA members. Today, Union Station continues to offer a wide range of New Haven passenger car sides – including washboards and Osgood-Bradley grill cars. Union Station car sides are done with a white styrene outer side and a crystal clear plastic inner side that are to be glued together. The clear inner side is also used for window glazing. Union Station also offers Train station Products 41-BNO truck kits, and observation roof-end parts. The observation roof-end can be used as a template to properly shape the matching floor end as well. 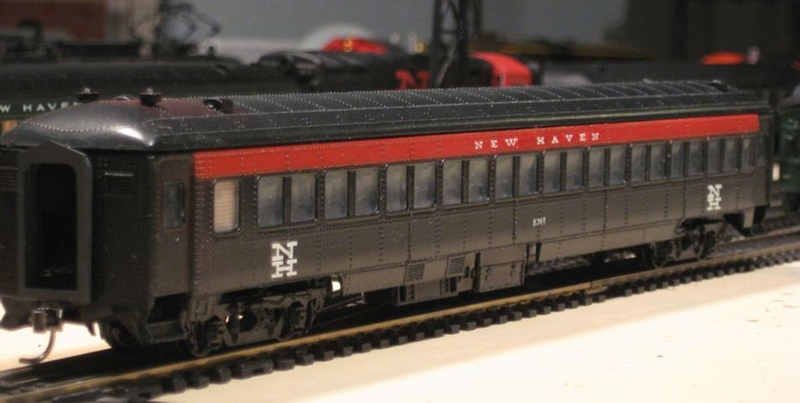 New Haven passenger car core kits are no longer available, but older E&B Valley and ECW kits that can be used as donors are still available on internet auction websites. In Fall 2016 Rapido Trains Incorporated delivered highly detailed 8600-series coaches and followed this in early 2018 with delivery of 300- and 400- series Parlor-Lounge cars, Like their earlier Osgood-Bradley New Haven products, these are beyond doubt the most highly accurate and detailed HO scale New Haven passenger cars ever offered. 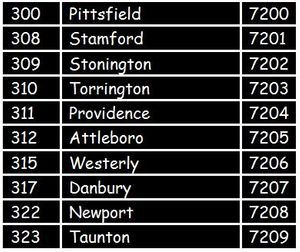 One can only hope more New Haven cars (200-series, please) will follow (and a re-run of 8600s). Seats in the coach compartment were Heywood-Wakefield rotating reclining seats with chromium plated steel tubular frames upholstered in dark blue plush mohair adorned with linen head rest covers decorated with a blue "script" monogram. The lounge compartment was outfitted with General Fireproofing Co.'s individual chairs with "Pig Skin" Redolite upholstery. By about 1955 the linen head rest covers on seats in the coach compartment were replaced with vinyl slipcovers. Three 8600-series coaches (8617, 8643, 8663) were destroyed in service and two (8639, 8655) were heavily damaged on July 14, 1955 in Bridgeport, Connecticut in a well- documented train wreck but were rebuilt and returned to service. One coach, 8661, was converted to the Southport Club, Car 5109, in 1968. The 8600-series coaches were ubiquitous, used on trains system-wide from delivery until the Penn Central years. Penn Central later sold 74 of the 8600s to MBTA and they remained in service in the Boston area until 1988. Coach 8623 is an E&B Valley kit model. The letter board, number board and herald plaques are made from 0.005: styrene and the letter board and number boards are cut to the correct length. 200-219 Baggage-Buffet-Parlor/Lounge Cars In October1948, Pullman-Standard delivered 20 baggage-buffet-lounge cars built in the former Osgood Bradley factory in Worcester, MA, as Plan W46610 Lot W6788 to the New Haven. Starting with the second group of cars first, cars 210-219 did not change configuration during their service lives. The lounge sections were furnished with General Fireproofing Company Chairs and the drawing rooms included General Fireproofing Company Folding Chairs and a Heywood-Wakefield Sofa. The day roomettes were outfitted with Heywood-Wakefield Seats and the chair compartment with Heywood-Wakefield Individual Rotating Chairs. Goodall fabrics were used for all upholstering materials. The first group of cars was subject to a series of changes in 1949, 1952, 1953 and 1956. The lounge sections were furnished with General Fireproofing Company Chairs and the drawing rooms included General Fireproofing Company Folding Chairs and a Heywood-Wakefield Sofa. The day roomettes were outfitted with Heywood-Wakefield Seats. Cars 206 and 207 were outfitted with Transportation Seat Company Seats in the card-playing section. Goodall fabrics were used for all upholstering materials. 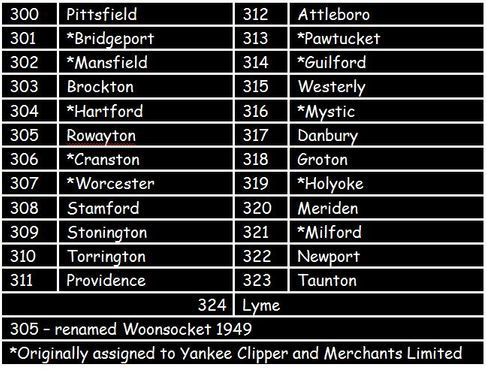 In 1949, Readville shops deleted 2 lounge seats in four cars and added telephone service and one lounge seat to two other cars, and lastly added telephone service and deleted 3 lounge seats in two cars. In 1952, two cars were rebuilt by adding two drawing rooms in the deleted 19’ Baggage section as Pullman-Standard Lot W R 6912. In 1953, four cars in this series were rebuilt by adding two drawing rooms in the deleted 19’ Baggage section. Cars 204 and 204 also had two Lounge seats as Pullman-Standard Lot W R 6943. Lastly, in 1956 telephone service was discontinued and the equipment removed. Baggage-Buffet-Parlor Lounge 210 KENT COUNTY is an E&B Valley kit model. In addition to replacing the letter board, name board and herald plaques with 0.005” styrene, the letter board and name board were cut to the correct sizes. All E&B Valley cars are lettered with Microscale decals. 300-324 36- and 52-chair Parlor Cars In August 1948, Pullman-Standard delivered 25 parlor cars of two seating configurations built in the former Osgood Bradley factory in Worcester, MA, as Plan W46611 Lot W6788 to the New Haven. As built, the first twelve cars, 300-311 were built as 36-chair parlors with a single row of Heywood-Wakefield Single Revolving Reclining Chairs featuring Goodall fabrics for upholstering material. Cars 312-324 were built as 52-chaor parlors with a double row of chairs on one side in an attempt to increase seating availability of desirable parlor chairs for passengers. However, this proved unacceptable by patrons and between 1949 and 1950 these cars were reconfigured to the same arrangement as the 300-311 cars at Readville shops. On the merger in 1969, the remaining parlors transferred to Penn Central with many moving to Amtrak on its formation in 1971. Parlor 311 PROVIDENCE is a Rapido Trains model. 400-404 Parlor-Lounge Cars In October 1948, Pullman-Standard delivered 5 26-seat parlor 14-seat smoking lounge cars built in the former Osgood Bradley factory in Worcester, MA, as Plan W46612 Lot W6788 to the New Haven. 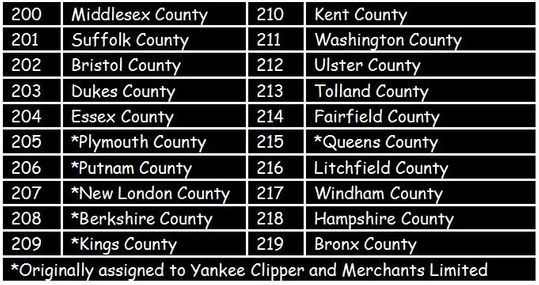 As built, these cars were named after local rivers, however in 1950 due to conflicting car names with the New York Central the cars were renamed after cities along the New Haven Railroad. The lounge section was furnished with General Fireproofing Company Individual Chairs and the chair compartment with Heywood-Wakefield Individual Rotating Chairs. Goodall fabrics for upholstering material were used throughout. Parlor-Lounge 401 NEW ROCHELLE is a Rapido Trains model.